My meditation today: If everyone could look at all people, expecting the best from them, not sitting in judgment of them, the world would be full of great expectation. 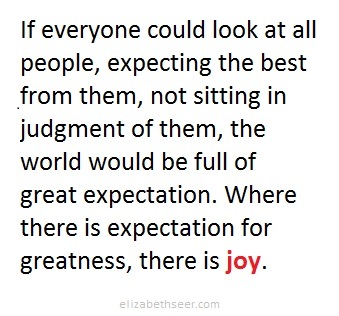 Where there is expectation for greatness, there is joy. Please think about this. Just remember that expectation and outcome could be different (as in what you expect of me, may not be what I deliver). Expect that you are being offered the other’s very best at that given moment, and forgive if the reality doesn’t meet your expectations. expect, expect goodness, expect greatness, great expectation, joy. Bookmark.